A few months ago, I was very excited to report that I had defied all expectations, (take that Mrs Gordon in 5th grade) and reached almost the pinnacle of human achievement by obtaining 100 Mbps internet speeds at home. 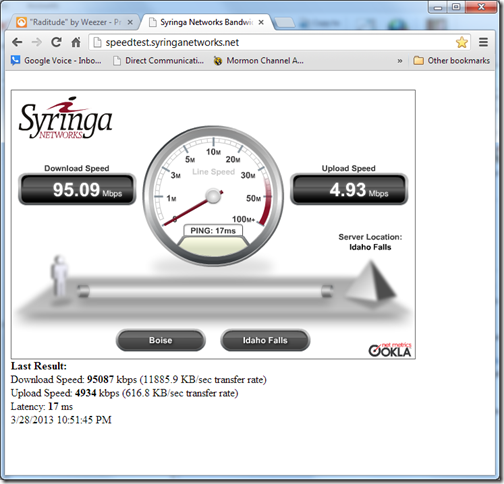 I am subscribing to 100Mb fiber optic service from my ISP, Direct Communications. Recently however, that dream came crashing down when we needed to rearrange the living room to fit in a new second-hand couch. The main computer desk had to be moved to the other side of the room, where of course, the only place it could possibly go was also the one corner in the house that was not pre-wired with a ready Cat-5 cable (RJ45) jack, since that corner was supposed to be a future fireplace. In my shortsightedness, when planning the construction I had thought, “Who would ever want an Ethernet enabled fireplace?” Silly me. Now of course, a few years later I can think of a hundred different reasons to have an Ethernet-enabled fireplace. So, now I had my main desktop computer, which is a new Dell XPS, sitting in a location where there was no wire. I didn’t think it would be a big deal since I knew my computer had a built-in wireless N card, but to my horror, when I ran a speed test after setting everything back up, while I used to consistently clock 100Mbps speed tests when directly wired to the basement router, the fastest speed I could now get over wireless was only about 18Mbps. 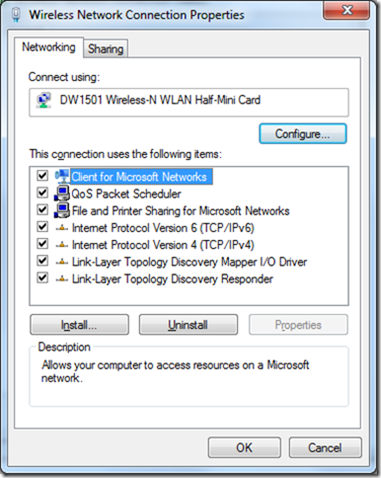 The computer’s internal wireless-N card was a DW1501 Wireless-N WLAN card, which, according to Dell’s product user guide, is supposed to have a network data rate of up to 270 Mbps for a 40 MHz bandwidth channel and 130 Mbps for a 20 MHz bandwidth channel. Most reasonable people would agree that 18Mbps was not close to either of those numbers. My wireless router is a new Cisco E2000, with Gig Ethernet ports, which had no problem supplying 100Mb internet speeds to the same computer when it was wired to the router, but now I was left with a fraction of those heady speeds. Of course, even at 18Mb I could still stream HD just fine to that computer, but what’s the use of paying for 100Mb speeds if you can’t see those on a speed test? It’s a matter of principle! Just to be sure there wasn’t just something weird with my desktop going on, I did a speed test on my Dell Studio XPS laptop to see if I could get any higher speeds with that radio, but sadly, 25Mb was the fastest internet speed I could get on my laptop. Now, this frustrating situation lends itself to the age-old question, if a computer is not showing the full advertised internet speed I am paying for, am I actually getting that speed? This is a question, or more often, complaint, sometimes leveled at ISPs by customers, who run speed tests from their PCs or phones or tablets and then conclude that they are being cheated if the results do not match what the ISP says it is providing . On the one hand, all the other wired devices in my home, the Xbox, the other older desktops, were still getting the same speeds as before. My tablets and phones on Wi-Fi were also still behaving just the same as before, indicating that they were still sharing the same 100Mb fiber optic speeds from Direct Communications that my router was handing out before. And yet, there it was, staring me in the face, that horrible speed test result which could not be denied or ignored, gnawing at me day and night. What was to be done? I I could not bang a new hole in the wall to feed a new cat5 cable down to my distribution center in the basement, especially since I had already finished the part of the basement underneath the new computer desk location. I clearly could not survive on a wireless connection to my PC. That’s when one of the techs suggested a life-saving device- a simple wired switch that I could use to extend my existing wired network after construction. I searched on Amazon for the most popular home Ethernet switch that had Gigabit ports (because, as I discovered with my previous old router, unless your equipment has gigabit ports, it will never deliver 100Mb speeds. 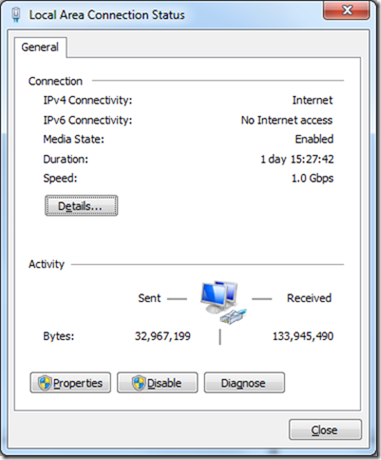 Any router or switch with only 100Mb ports, even wired, will not deliver more than about half that speed.) 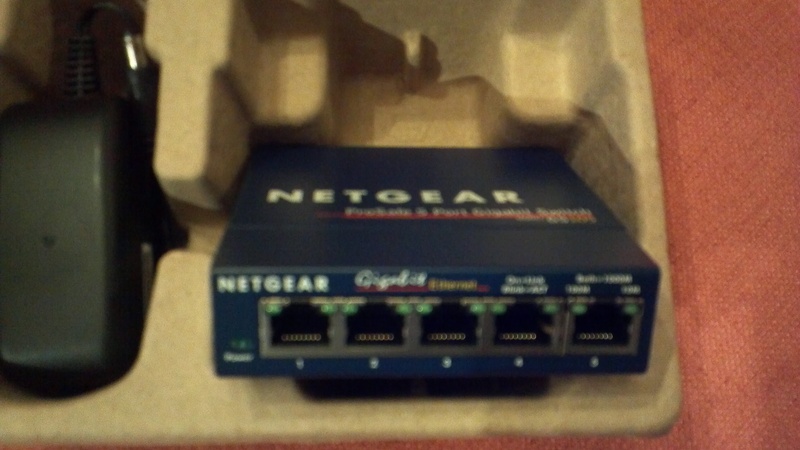 The most popular switch was the NETGEAR GS105 ProSafe 5-Port Gigabit Ethernet Desktop Switch, for $39.99, which arrived in 2 days and was very simple to install. I simply unplugged the Ethernet cable to my Xbox, plugged that cable into the new switch, and plugged in new Ethernet cables from the switch to my PC and Xbox, and now even have a couple of ports left over for any new devices I may want to direct wire to the router. I immediately ran a speed test on my PC, which now had a wired internet connection again, and was very pleased to see that needle go straight up to 95Mb. Lesson1) If you are serious about speeds, wire all your devices directly to the router. Wireless is the enemy of speed, no matter what the wireless card specs claim. Lesson 2) A simple network switch can very easily and cheaply extend your internal wired network without sacrificing performance. Lesson 3)Even though I was not seeing 100Mb to my computer, I was still getting 100Mb to my home from my ISP. All I needed was better network equipment to see those speeds again. The bottleneck was the wireless limitations inside my own equipment. Lesson 4) If you are building a home, wire everything and every corner. Don’t believe your builder if he says everything will be wireless someday inside the home. You never know when you might want more speed, and what the bandwidth demands of our future appliances will be.